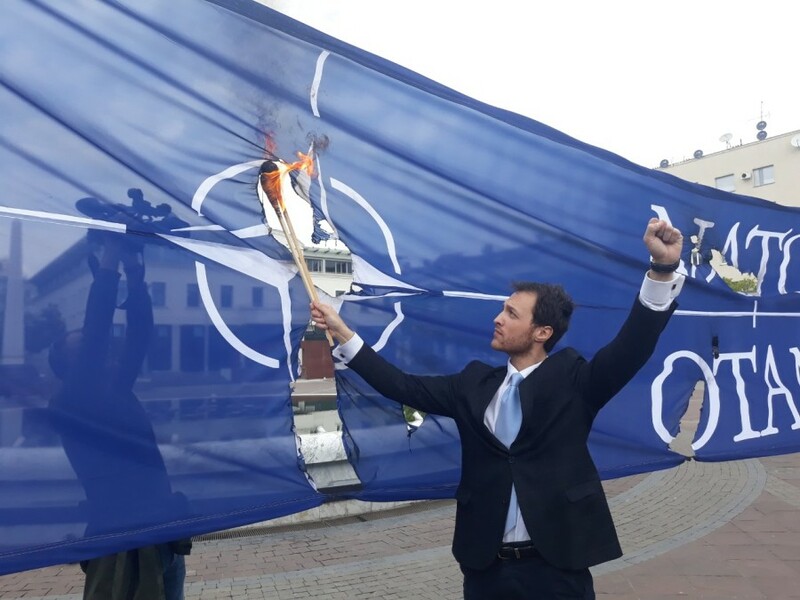 Leader or Real Montenegro Party, Marko Milačić, set the flag of the NATO alliance on fire on the main city square in Podgorica, as a way to congratulate the Alliance’s 70th birthday. Milačić has thus marked two decades since NATO bombed Yugoslavia. “NATO, I wish you happy birthday, God give it be the last”, Milačić said, adding that it was the largest flag of the NATO alliance that someone in the history of this alliance set on fire. His intention was to send a message that the Alliance is an undemocratic organization that it kills innocent people around the world, “and that this is a flame of freedom that needs to be seen in Washington and Brussels”. Milačić said that this will be a tradition every April 4th, until a decision on Montenegro’s membership in the NATO Alliance is adopted in a democratic, fair and free referendum, as the vast majority of Montenegrin citizens want. “Today, April 4th, we celebrate 70 years since the founding of the NATO alliance, more precisely: 70 years since the world had the opportunity to see how democracy is fighting with anti-democracy. 70 years of NATO are 70 years of killing, 70 years of NATO are 70 years of intimidation, 70 years of the NATO alliance are 70 years of killing people in other territories and resources, 70 years of the NATO alliance are 70 years of their propaganda, 70 years of the NATO alliance are 70 years of evil”, Milačić said, inter alia. After the flag burning performance Milačić, followed by supporters, went over The Russian Bridge to the Ministry of Defence building where he threw the remains of the NATO flag, which he had previously burned, over the fence. “Defense Minister Predrag Bošković said today that the NATO alliance is the most successful military and political organization in history. Here is a point to agree with Minister Bošković, a former member of the Beli Orlovi formation. It is true, Mr Bošković, that NATO’s is most successful organization in history, but the most successful in killing, destroying, spreading instability, not only in Montenegro, but around the world. It is most successful in something more – in killing our children, and you should be ashamed Minister Bošković for such a statement”, Milačić said. The Ministry of Defense reacted on the Milačić’s actions, saying it was another failed protest by those who are trying to return the country to the “Balkan mud of conflicts”. “The actions of one of the leaders of the current opposition parties in the Independence Square in Podgorica, on the occasion of the 70th anniversary of the founding of NATO, is just another strong argument of the correctness of all the decisions that Montenegro has made since the restoration of its independence, one of which is definitely the Montenegrin membership in the Alliance”, stated the Ministry.